Perridon, Jacques [Яків Перрідон] – Dutch priest of the Ukrainian Graeco-Catholic Church (UGCC); born on 7 March 1900 in Rotterdam, Netherlands; died on 2 September 1965 in the Netherlands; buried in Crooswijk General Cemetery in Rotterdam. Perridon graduated from the Gymnasium Erasmianum secondary school in Rotterdam. Following a visit to the Netherlands, in April 1920, by Metropolitan Andrei Sheptytskyi (during which Sheptytskyi called for action aimed at bringing about unity between Eastern and Western Christianity), Perridon left the Netherlands for Lviv, Western Ukraine (at that time mostly under Polish rule), to study theology at the Graeco-Catholic seminary. He learned Ukrainian and adopted the Byzantine rite, and was ordained as a deacon of the UGCC in 1925, and as a priest in 1928. In 1930 he was appointed rector of the Graeco-Catholic Minor Seminary in Lviv, which was independent of the Polish authorities. In 1937, for his work in the interests of the local Ukrainian population, he was banned from the territory of Poland. He moved to France where he was made responsible for the newly-established Ukrainian Graeco-Catholic mission in Paris. In 1938, after the death of the Rev. 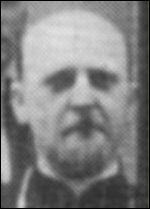 Louis Van den Bossche, he took over responsibility for the pastoral care of Ukrainian Graeco-Catholics in Great Britain. He periodically visited Manchester, England, to hold church services for the local Ukrainian community. In August 1938 he gave an interview to the London-based Catholic Herald in which he spoke of the suppression of Ukrainian cultural life in Poland, thereby provoking further debate on the issue in the newspaper. In 1946 he was appointed, by Bishop Ivan Buchko, the apostolic visitor for Ukrainian Graeco-Catholics in Western Europe, as his vicar general for France, Switzerland and Luxembourg. Until August 1949 his jurisdiction also formally included the parishes of the UCC in Great Britain. From early 1949 he was a member of the Shevchenko Scientific Society which was revived after the war in Germany. In the years 1945 to 1950 he was head of the Ukrainian refugee relief committee in France (Ukrainska sluzhba suspilnoi opiky). From 1952 he served as vicar general for Belgium, the Netherlands, Luxembourg and Scandinavia.